PLAX: LV normal size, and thickness. 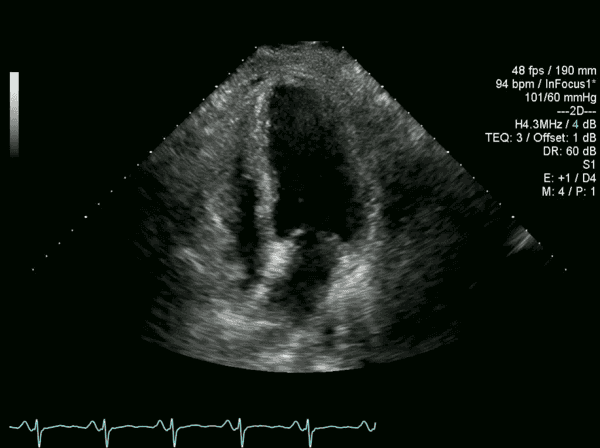 Moderate-severely reduced LV function with mid anterior septal akinesis but with basal preservation. There is some tethering of the posterior mitral valve leaflet. PSAX at mid papillary level showing akinesis of all segments of the LV except the lateral wall which has severe hypokinesis. AP4C shows overall moderate-severe reduced LV function, with mid and apical akinesis, but with basal function preservation. RV function is normal size and function. 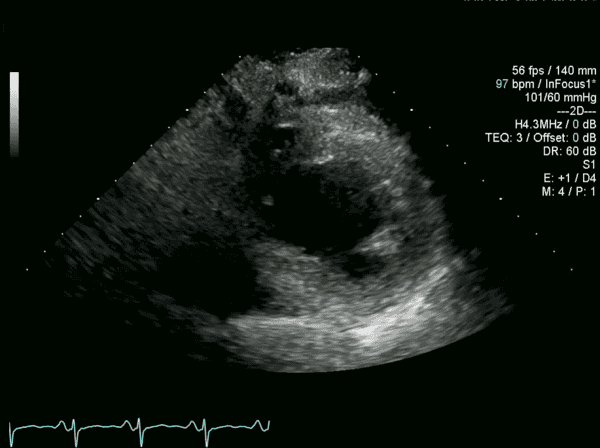 LA mildly dilated compared to the right atrium. On further questioning, the patient revealed she recently had an episode of gastroenteritis. In the past she has previously had similar presentations of acute heart failure complicating her medical illnesses. You diagnose acute apical stress cardiomyopathy, also known as apical ballooning syndrome, Takotsubo cardiomyopathy or broken heart syndrome. In this syndrome there is reversible regional systolic dysfunction of the myocardium, but with no acute coronary lesion on angiography. Doctors have only become aware of this syndrome since the 1990s, while vets were aware of “cage cardiomyopathy” since the 1950s. Approximately 60% of patients will have an emotional trigger (27%) or physical trigger (36% – such as gastroenteritis), suggesting excessive catecholamine as a potential aetiological agent. Other potential causes include microvascular spasm or the reversible shutting off of myocardial β receptors. Other rarer forms include basal or reverse type (2.2%), and focal type (1.2%). 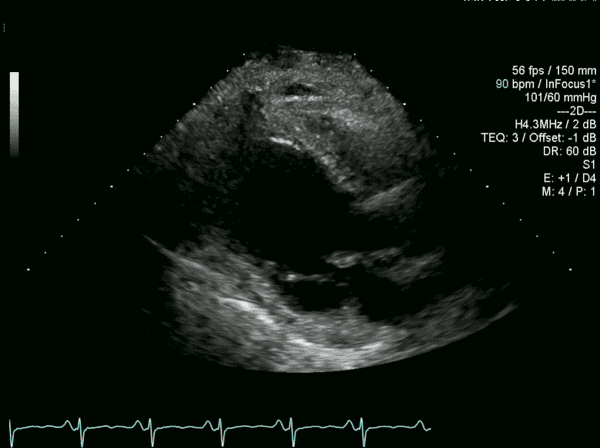 The right ventricle is involved in 26% of cases. Management is generally supportive, and is similar to acute heart failure. Non catecholamine strategies may be preferred (such as milrinone or mechanical heart supports) . If LVOT obstruction is present, then avoiding inotropes is important, and gentle beta blockade or pure alpha agonists such as phenylephrine may be required. Prognosis is overall similar to acute myocardial infarction, with the majority of patients making a full recovery over 1-4 weeks. In patients with shock, the mortality rate is around 19%.